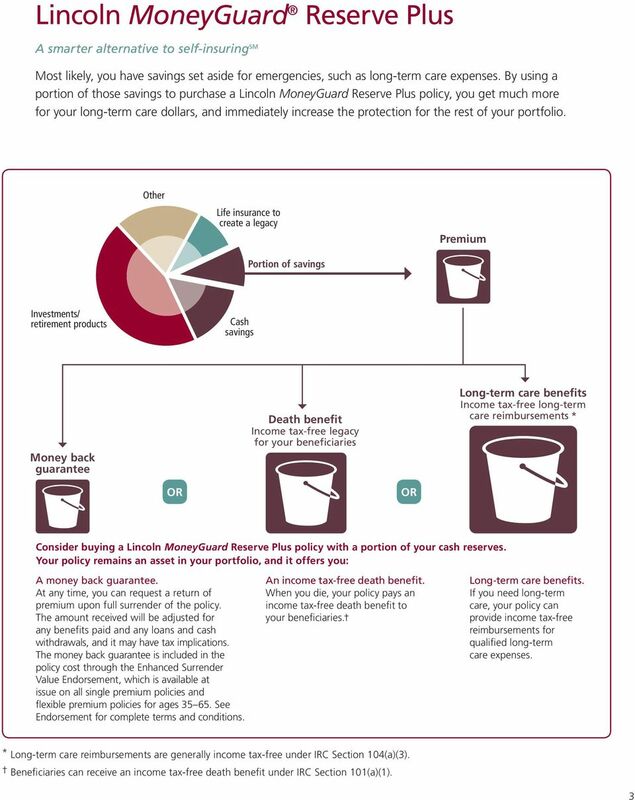 Download "Lincoln MoneyGuard Reserve Plus"
5 Why Lincoln MoneyGuard Reserve Plus? No deductible or elimination period Your cost of coverage can never increase The costs for your policy s long-term care benefits are set at issue and will never change. You gain the power to get more for your long-term care dollar Experience multiple times the leverage for your long-term care dollar. 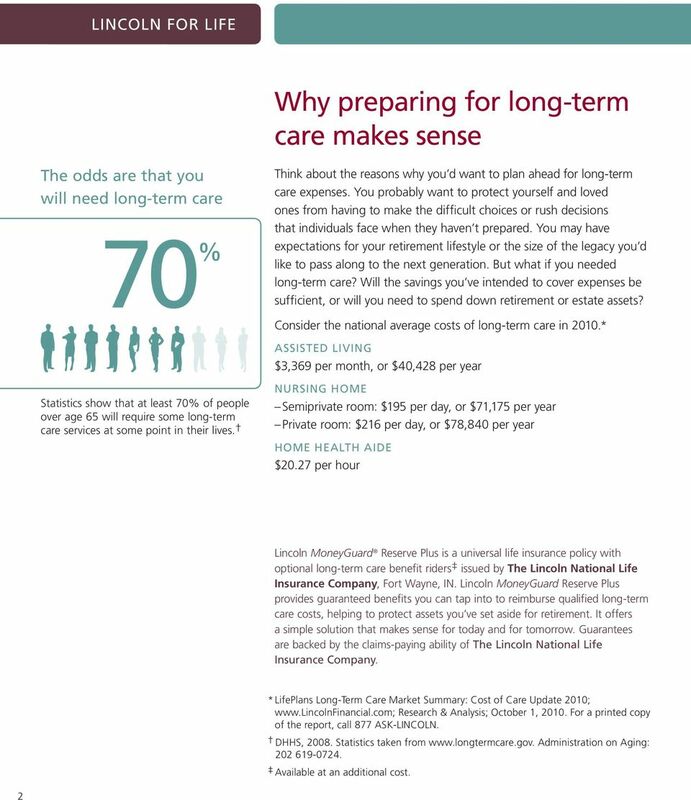 You ll find that your long-term care benefits are much greater than your premium outlay. Opportunity of tax advantages Your long-term care benefits are intended to be income tax-free. Your policy provides an income tax-free death benefit if you don t need long-term care. Choice of care setting The decision is yours from home healthcare to assisted living, nursing home care, adult day care, personal care services, hospice care and alternative care services. Your qualified long-term care expenses can be reimbursed up to your monthly maximum benefit for all levels of care. International benefits You can access your CCBR benefits while living abroad. 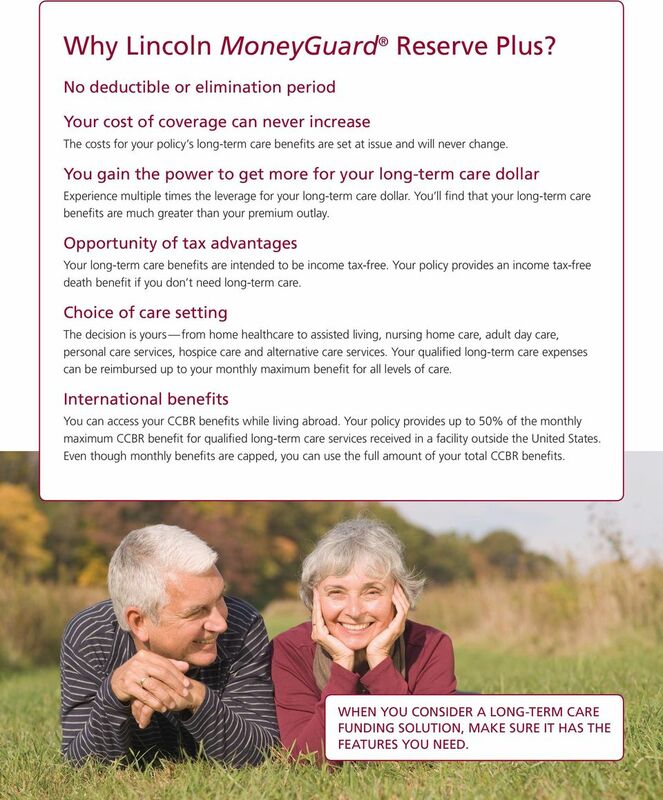 Your policy provides up to 50% of the monthly maximum CCBR benefit for qualified long-term care services received in a facility outside the United States. 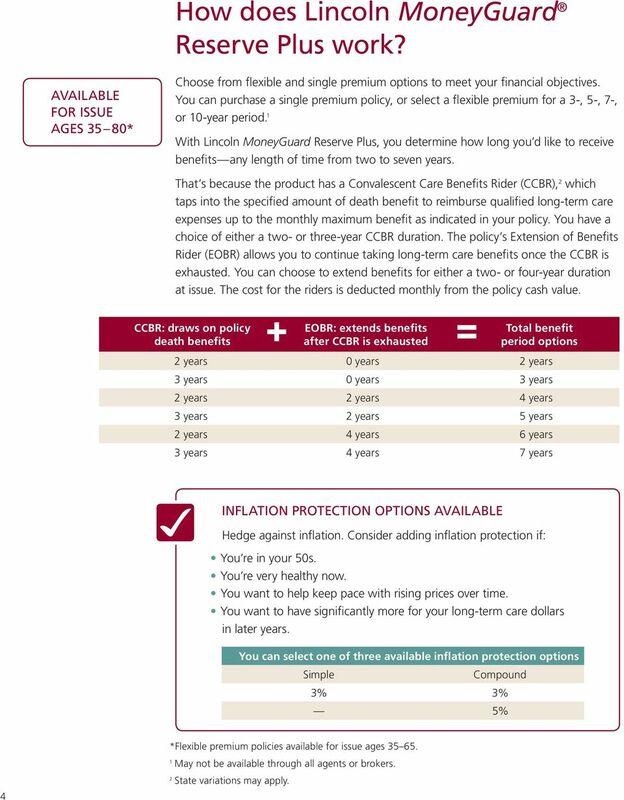 Even though monthly benefits are capped, you can use the full amount of your total CCBR benefits. 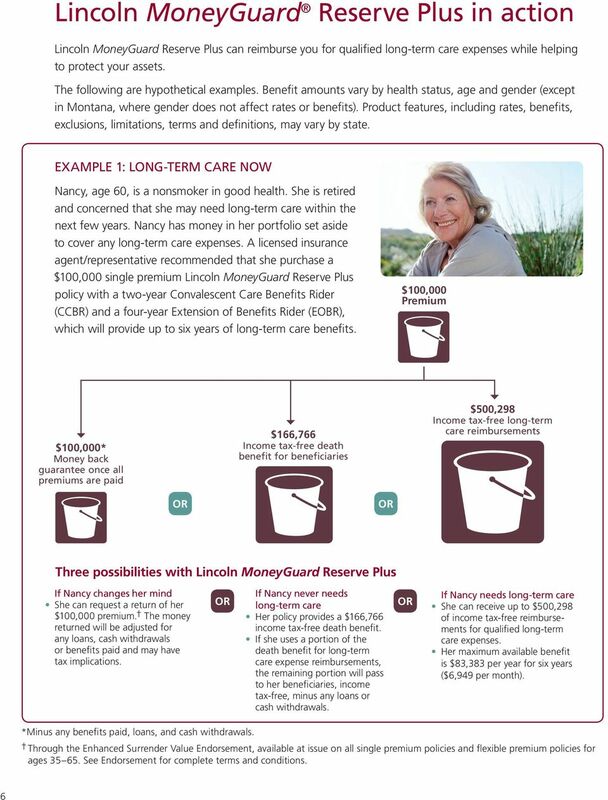 When you consider a long-term care Funding solution, make sure it has the features you need. 8 HELPING PEOPLE FACE THE FUTURE WITH CONFIDENCE At Lincoln Financial Group, we ve spent more than 100 years living up to the character of our namesake: integrity, honesty, and the belief in a better tomorrow. We provide advice and solutions to help people save for tomorrow, secure and maximize their income, protect themselves and their loved ones, and prepare for the unexpected. 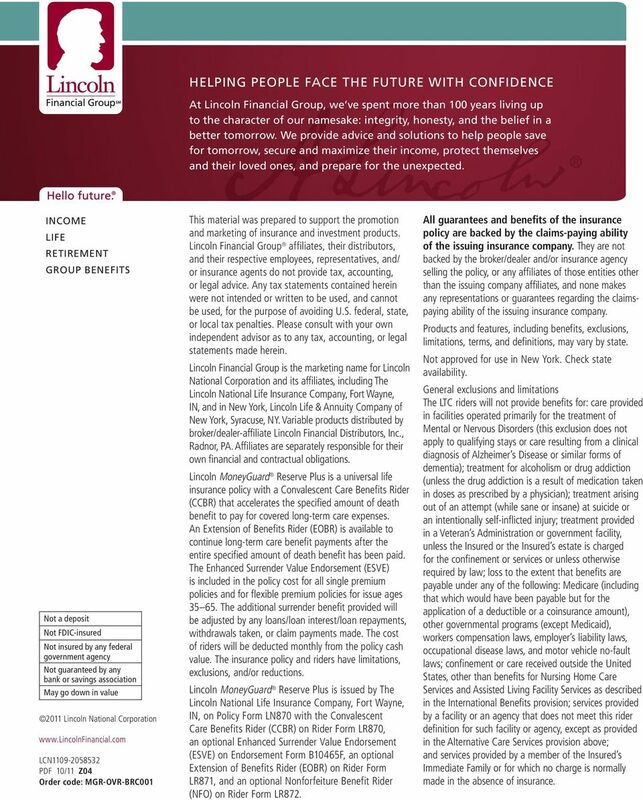 INCOME LIFE RETIREMENT GROUP BENEFITS Not a deposit Not FDIC-insured Not insured by any federal government agency Not guaranteed by any bank or savings association May go down in value 2011 Lincoln National Corporation LCN PDF 10/11 Z04 Order code: MGR-OVR-BRC001 This material was prepared to support the promotion and marketing of insurance and investment products. Lincoln Financial Group affiliates, their distributors, and their respective employees, representatives, and/ or insurance agents do not provide tax, accounting, or legal advice. Any tax statements contained herein were not intended or written to be used, and cannot be used, for the purpose of avoiding U.S. federal, state, or local tax penalties. Please consult with your own independent advisor as to any tax, accounting, or legal statements made herein. Lincoln Financial Group is the marketing name for Lincoln National Corporation and its affiliates, including The Lincoln National Life Insurance Company, Fort Wayne, IN, and in New York, Lincoln Life & Annuity Company of New York, Syracuse, NY. Variable products distributed by broker/dealer-affiliate Lincoln Financial Distributors, Inc., Radnor, PA. Affiliates are separately responsible for their own financial and contractual obligations. 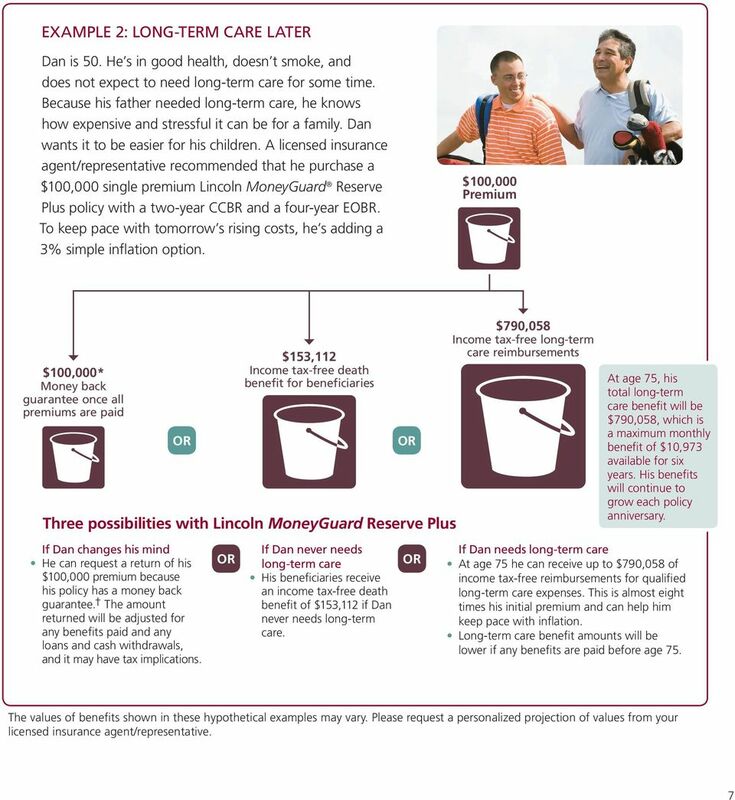 Lincoln MoneyGuard Reserve Plus is a universal life insurance policy with a Convalescent Care Benefits Rider (CCBR) that accelerates the specified amount of death benefit to pay for covered long-term care expenses. An Extension of Benefits Rider (EOBR) is available to continue long-term care benefit payments after the entire specified amount of death benefit has been paid. The Enhanced Surrender Value Endorsement (ESVE) is included in the policy cost for all single premium policies and for flexible premium policies for issue ages The additional surrender benefit provided will be adjusted by any loans/loan interest/loan repayments, withdrawals taken, or claim payments made. The cost of riders will be deducted monthly from the policy cash value. The insurance policy and riders have limitations, exclusions, and/or reductions. 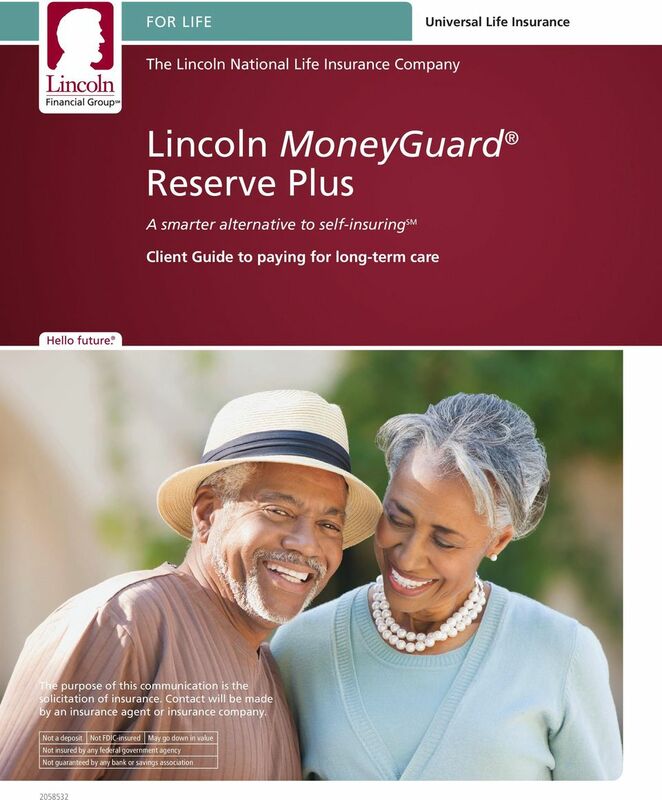 Lincoln MoneyGuard Reserve Plus is issued by The Lincoln National Life Insurance Company, Fort Wayne, IN, on Policy Form LN870 with the Convalescent Care Benefits Rider (CCBR) on Rider Form LR870, an optional Enhanced Surrender Value Endorsement (ESVE) on Endorsement Form B10465F, an optional Extension of Benefits Rider (EOBR) on Rider Form LR871, and an optional Nonforfeiture Benefit Rider (NFO) on Rider Form LR872. All guarantees and benefits of the insurance policy are backed by the claims-paying ability of the issuing insurance company. They are not backed by the broker/dealer and/or insurance agency selling the policy, or any affiliates of those entities other than the issuing company affiliates, and none makes any representations or guarantees regarding the claimspaying ability of the issuing insurance company. Products and features, including benefits, exclusions, limitations, terms, and definitions, may vary by state. Not approved for use in New York. Check state availability. General exclusions and limitations The LTC riders will not provide benefits for: care provided in facilities operated primarily for the treatment of Mental or Nervous Disorders (this exclusion does not apply to qualifying stays or care resulting from a clinical diagnosis of Alzheimer s Disease or similar forms of dementia); treatment for alcoholism or drug addiction (unless the drug addiction is a result of medication taken in doses as prescribed by a physician); treatment arising out of an attempt (while sane or insane) at suicide or an intentionally self-inflicted injury; treatment provided in a Veteran s Administration or government facility, unless the Insured or the Insured s estate is charged for the confinement or services or unless otherwise required by law; loss to the extent that benefits are payable under any of the following: Medicare (including that which would have been payable but for the application of a deductible or a coinsurance amount), other governmental programs (except Medicaid), workers compensation laws, employer s liability laws, occupational disease laws, and motor vehicle no-fault laws; confinement or care received outside the United States, other than benefits for Nursing Home Care Services and Assisted Living Facility Services as described in the International Benefits provision; services provided by a facility or an agency that does not meet this rider definition for such facility or agency, except as provided in the Alternative Care Services provision above; and services provided by a member of the Insured s Immediate Family or for which no charge is normally made in the absence of insurance. Preserving value for the next generation. Lincoln LifeLINC Advisor Guide. For agent or broker use only. Not for use with the public.